In August 2010 a strange experience sent me briefly into a bizarre world of movement, light and lack of form. It didn’t last long, but I emerged with an odd book called Quantum Life: A User’s Guide, written in English, a Quantum Life language. I’m posting it to my blog, and over the course of a few months hope to complete it. This page will contain links to all the entries. Hey, a Rik Emmett quote! 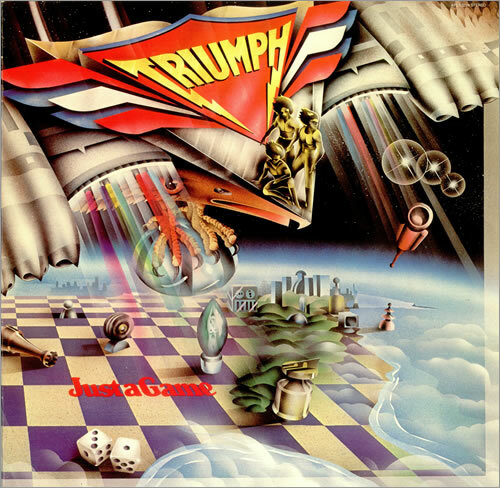 Triumph was the first band I had ever seen live as a kid! With the exception of one guy from Louisiana that I met at a Cowboys game, i never thought they made it out of Canada. Will check out the “Quantum Stuff” a little more, but in the meantime, very cool! I’m not sure if the quantum stuff is going anywhere. It’s an attempt at quasi-spiritual fiction. I’ve always been a big Triumph and later Rik Emmett in his solo career fan. Triumph was pretty big in South Dakota where I grew up. Hello Scott – the quantum life book is interesting. Are you not planning on finishing the post? Thanks – I will get back to that, thanks for the impetus! I just posted another entry, and plan to start more regularly adding posts! Anymore Quantum Life follow up Scott? It’s been a while 🙂 And thank you for your refreshing inspiration in the world of seemingly-ugly-politics as always! I’ve been posting a lot less the last few months, but you’re right, it is time to get back to this project. Thanks again for another push! Hi Scott, I came across your Quantum Life series by accident after I performed a reverse-image lookup of a piece of art I liked—the hidden faces painting you placed at the top of the Empaths and Extensions section. My attention was soon arrested. I read the series and appreciated your well-articulated transcription of the main game parameters. Thank you! I hope you transcribe more from that book. I suspect you still have some extra pages left to transcribe? I also found a partial copy of the Quantum Life book in August 2012. Mine has a technical addendum explaining diagnostic and operational procedures for the game that probably won’t matter to beginning players, but to advanced players, their implications are intriguing and game-changing. I’ll share some paragraphs from the technical section labeled ‘Quantum Backdoor’ that might be useful (or at least intriguing) for advanced players. The print on my manual is a bit faded and hard to make-out in places. I hope I got my transcription right! When Sunitolp designed the Quantum Life game he decided there needed to be a ‘Quantum Backdoor’ mechanism by which information could be exchanged directly between advanced game players and the ‘green room’ in the real world where Sunitolp operates. This special Quantum Backdoor would be present in all players who possessed biological consciousness. In the Quantum Life world that means all plants, trees, grasses, animals, and humans contain the Quantum Backdoor. The players just don’t realize it because the backdoor is too well concealed. Under normal game-play turns, players remain unaware of the Quantum Backdoor that Sunitolp evolved into their neural biology. If the Quantum Backdoor happens to be accessed by a player, the Quantum Life game will pause and the player will then rapidly exit their ‘game body’ and travel down a quantum tube made a light. At the end of the tube of light the player finds themselves home in the real world for a temporary visit outside the hologram that comprises Quantum Life. During the player’s short visit home they will meet game counselors and Game Masters and perhaps Sunitolp himself to review their current game play strategy. Communication between player and game advisers occurs telepathically or symbolically. The player will normally receive guidance from the counselors in the real world before returning back to their game role in Quantum Life with a clearer picture of their mission (among other benefits). In Quantum Life some players also travel through the Quantum Backdoor when having a near death experience (NDE), or through deep meditative states. In fact, during earlier eras of Quantum Life “time,” very few players even discovered how to access the Quantum Backdoor. Those who did discover how to access it were usually holy persons or philosophers who invested decades of game play in meditation and ascetic practices. Even then, such advanced players might only access the Quantum Backdoor a handful of times during their round of game play. For instance, the philosopher Plotinus is reputed to have said he only activated his Quantum Backdoor four times during his entire turn playing Quantum Life! What does this special back door look like to players? In the Quantum Life language of English and in the era we are presently playing in, the backdoor appears to players as a molecule, an incredibly tiny crystal that is found in, or can be enzymatically synthesized by, every life form on the particular Quantum Life playing field called Earth. Players who enjoy studying molecules have determined this one is a neurotransmitter and its purpose is not well-understood by the players in our present era of Quantum Life. But what’s clear to players who access this molecule is that it is *the* Quantum Backdoor. It just looks a little funny to players that it’s so tiny and strange in appearance. In the Quantum Life language called English, Sunitolp’s Quantum Backdoor is called N,N-dimethyltryptamine or ‘DMT’ for short. Accessing the Quantum Backdoor is a process suggested only for advanced players and those struggling with extremely challenging situations in game play that lead them to question the purpose of the game and whether it’s even worth continuing to play. Or those players who believe they can bring something back from the real world to improve game play for the other players in Quantum Life. I could go on but I’m not sure if the rest of the technical section would be interesting, it all gets pretty detailed from here on out and probably sounds like a bunch of gibberish. If you’re intrigued and want to learn more about the Quantum Backdoor I’d suggest watching or reading “DMT: The Spirit Molecule,” based on the work of Stanford-trained psychiatrist Dr. Rick Strassman. Thanks again for the Quantum Life manual you shared. I’m a subscriber now. Oh, thank you “livinganexaminedlife”! I have to add to the series – I haven’t continued it for some time. Cool that you found the technical manual! Have a beautiful day!